In this article, we will discuss SaveToDB Add-In for Microsoft Excel. 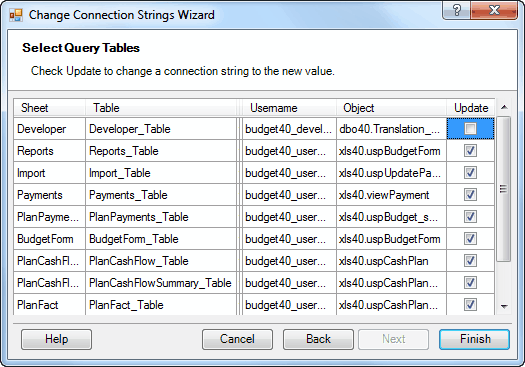 The SaveToDB add-in allows connecting to stored procedures and changing a group of connections strings of existing Excel data tables. 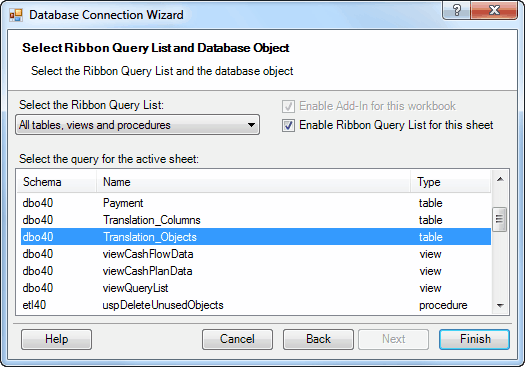 You can change the query of a data table using the ribbon Query List. You can change the values of stored procedure query using the ribbon. Use translation views to translate Excel table column names to a user language dynamically. 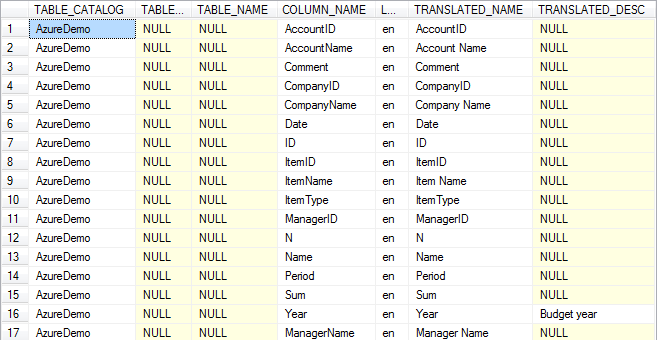 Use translation views to translate database object names to a user language. Use views as data sources for stored procedure parameter controls. The add-in allows creating custom views for database queries that significantly reduces user requests to database developers. 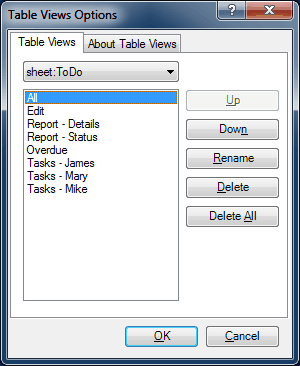 The Table Views group also are duplicated at the Data tab. See details below. The SaveToDB add-in contains a powerful and configurable Connection Wizard. You can easily connect and reconnect to any database object including the stored procedures. 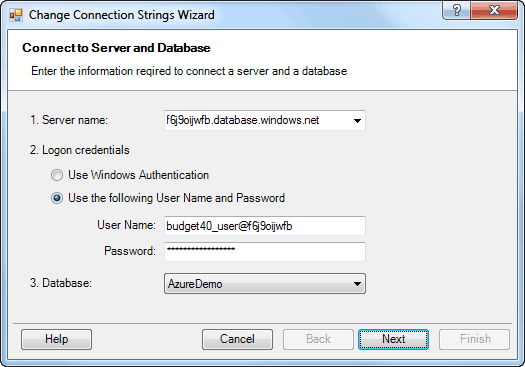 Using the built-in Excel connection wizard, you cannot select a stored procedure as a data source. 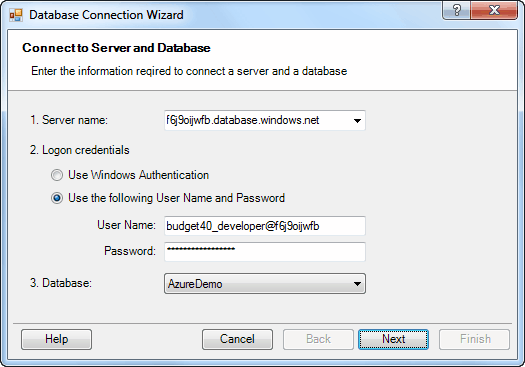 The result of the SaveToDB connection wizard is a native Excel ListObject with QueryTable connected to a database table, view, or a stored procedure. By default, a user can see and select any database object with SELECT or EXECUTE permission. You can write certain views that filters database objects available to select. 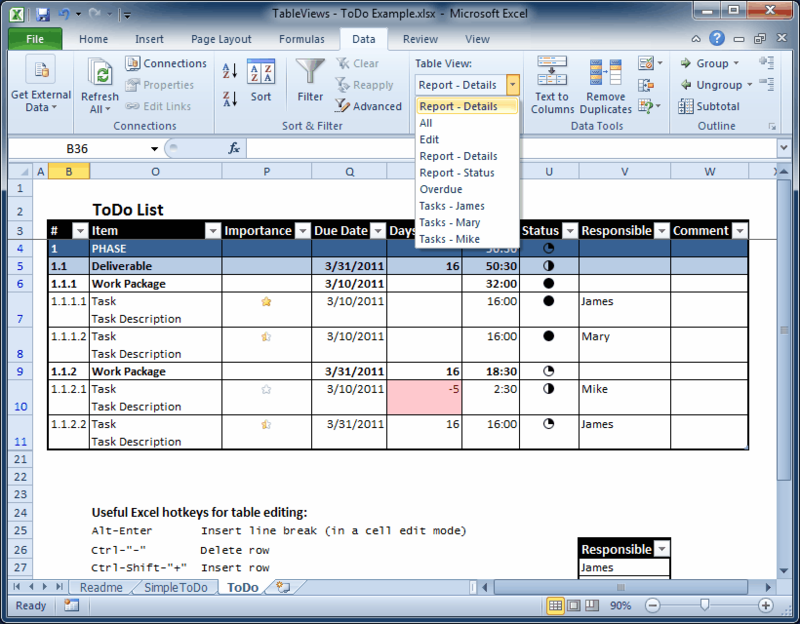 For example, the xls40.viewQueryList view filters the objects meaningful for business users. The last three fields are used as database data update procedures. See Excel-SQL Server Import-Export Using Excel Add-Ins for details. Pay attention to the Enable ribbon Query List for this sheet checkbox. 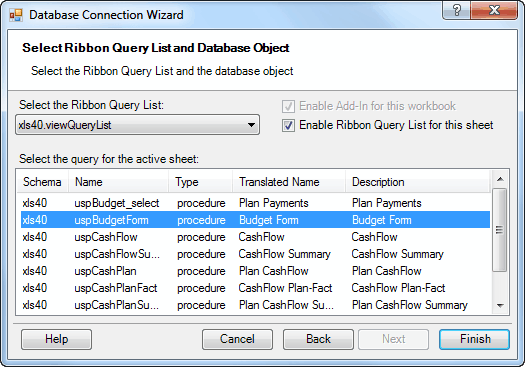 If a user enables this option, then he can change the query using ribbon Query List instead of the Connection Wizard later. Database object names are good for database developers but not suitable for business users often. Sometimes, the developers do not remember the meaning of the objects. So, recognizable business names and descriptions of the database objects is a good practice. The translation feature supports not only "business" names but translations to any language. Just specify a preferred data translation language in the Options dialog. You can use your implementation of translation infrastructure. Just prepare a view for the add-in. You can find a complete example of a translation service implementation in the SaveToDB SDK. You can change a group of connections strings using the SaveToDB Change Connection Strings Wizard. Step 1. Connect to a new server and a database. Step 2. Select the required data tables. The wizard makes the changes and reports about results. 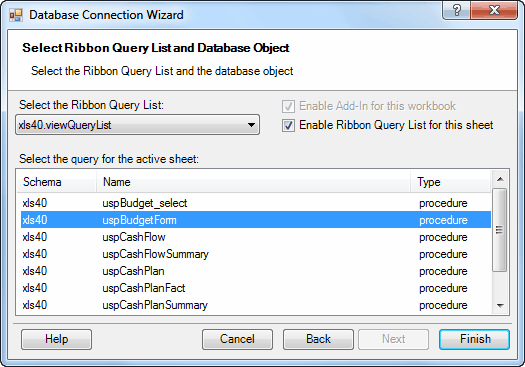 If you enable the ribbon Query List for the sheet in the Connection Wizard, you may change a query right in the ribbon Query List. By default, the native database object names are used. However, if a translation service is implemented and activated, you can use business names instead of database ones. In facts, you have tables after query change as they looked before. This feature allows using a few worksheets only for any number of database queries. SaveToDB does not restore external formulas and links. So, if you use table data in other Excel objects, just disable the ribbon Query List for a sheet. Stored procedures are the most powerful database objects for reporting. Using stored procedures you can make dynamic pivot tables and dynamic columns reports. Moreover, you can use parameters. Excel itself has no UI controls to connect to stored procedures and to change their parameters. SaveToDB automatically defines procedure parameters and places them to the ribbon. On the screenshoot below, the xls50.uspStockComparison procedure has 5 parameters: @Symb1, @Symb2, @Symb3, @StartDate and @EndDate. SaveToDB stores parameter values history, and you can select a value from the list. You can find a complete example in the SaveToDB SDK. We talked about translation service briefly in the Connection Wizard topic above. So, you can provide business names, short descriptions, and full comments for database objects in different languages using translation database views. 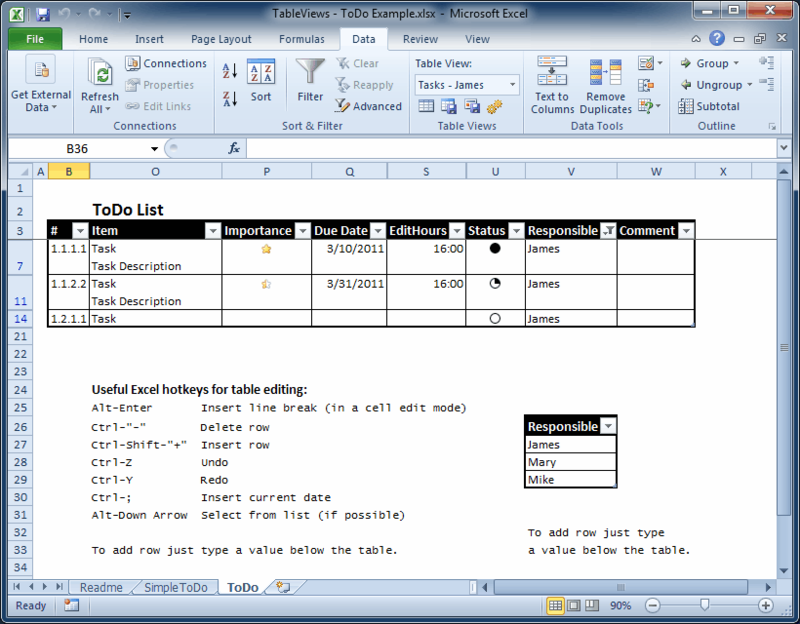 The example view uses values from a regular database table that may be edited using Excel with SaveToDB. You can find this example in the SaveToDB SDK. SaveToDB can dynamically translate Excel table column names if a translation view is available. This feature solves the eternal problem of column name changes wanted by users. Business users can modify the columns names themselves as often as they want; as database developers, we do not care about this. A server configuration view is used to assign stored procedures to events of specific queries. As you can see, the xls50.uspStockHistory stored procedure is used to handle the ContextMenu event on any column of the xls50.uspStockPerformance object. The TradeHistory worksheet is used to show the results. You can check the loaded configuration using SaveToDB Options dialog. As you can see, the xls50.uspStockPerformance object is opened on the Reports and Performance sheets. The handlers are used on the both sheets. Pay attention that a user see "Stock Trade History" menu item instead of "xls50.uspStockHistory" as a name of the handler. 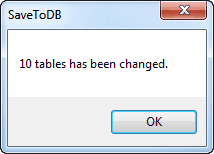 SaveToDB uses translated names of database objects if possible. See discussed above User Names and Descriptions of Database Objects topic. To develop a few server-side mega-views and to customize the results at the client-side. To develop a lot of required views at the server-side. "I need only this, this and this columns, and only rows matched these conditions." - said the user. "You may hide the other columns and apply auto-filters." - said the developer. "It&apos;s a waste time for me!" - said the user. "It&apos;s outside of the project scope, and it increases the development and maintenance costs." - answer the developer. Fortunately, you may save sets of applied auto-filters and visible columns. Just one click, and a new table is ready! This feature eliminates user&apos;s waste time and saves the developer&apos;s time. Of course, a user can add and control the views itself. 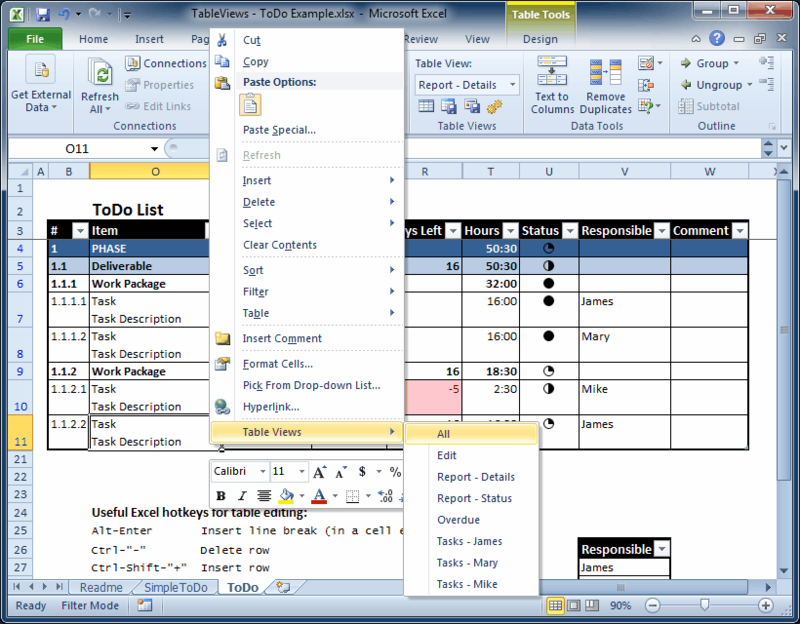 Using the SaveToDB add-in, you may transform the Microsoft Excel to a feature-rich database application easily. Start with default options, then add required features using only server-side configuration views and stored procedures.